During the most recent GOG sale they held some competitions where you had to identify five games that quickly flashed up on a video. Thankfully for me, I managed to guess one of them and I received $10 credit to use on their catalogue. So once again, GOG has been nice enough to give me free stuff. Thanks again guys :). I obviously used the credit to purchase the point 'n' click adventure game The Samaritan Paradox. I'm a bit of a fan of retro styled point 'n' click adventures due to my interest in developing them with Adventure Game Studio (AGS) in the past and more recently thanks to some excellent commercial ones by Wadjet Eye Games such as Gemini Rue, The Shivah and Resonance. Let's be clear though, The Samaritan Paradox although looking similar to those games isn't developed by them and is in fact developed by Faravid Interactive. It's also published by Screen 7, the same guys that brought us Heroine's Quest. Voice acting: Ord's voice actor is pretty convincing and the rest are generally good too. Soundtrack: Although there aren't too many tracks they're pretty good thanks to composer Lannie Neely and some definitely capture the feel of the 80s (which is when the game is set). 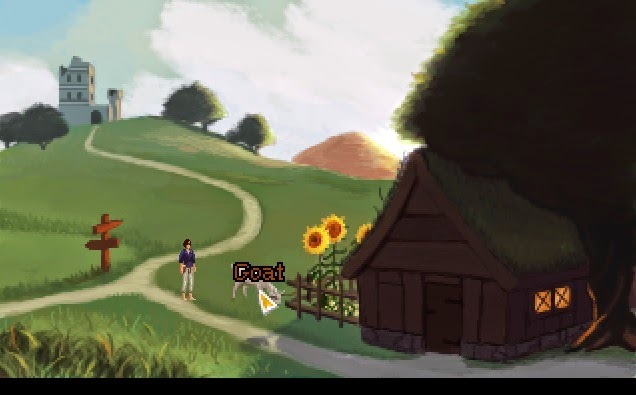 Graphics: Okay I'm not going to criticise the blocky, pixellated, low-res graphics as many retro point 'n' click adventure games appear that way, what I will criticise is the fact that sometimes the perspective seems to be a bit off - i.e. sometimes you end up looking like a 50 foot giant when you really shouldn't. Unintuitive UI: For starters the quit menu button isn't immediately apparent. There is a red "X" which you'd usually associate with "Cancel" but that's apparently the "Quit Game" button. Also pressing ALT+ENTER doesn't minimise the game if it's already in fullscreen but instead restarts the game! I've lost progress in my game thanks to this surprise. Bugs: The mouse sometimes refuses to work outright when you load a game. While the main website suggests changing rendering modes (i.e. between Direct3D and DirectDraw) and while that did work once or twice for me, eventually it didn't work at all. So now I'm left to play the game in windowed mode as it's the only way I can play the game. Difficulty: I've already needed to use a walkthrough twice in order to get past puzzles. In one puzzle I managed to pick a solution to a book that was foreshadowing the puzzle but it turns out it was a red herring since my solution was in the superset of solutions. The actual solution is related but can be solved in an easier way - i.e. thanks to the earlier hint I overcomplicated things. The second puzzle involved some knowledge of myths, legends and history, while at the same time connecting it to a poem. It was unlikely I would have ever got the second puzzle without some help and the game doesn't offer hints of any kind like modern adventure games. Some might enjoy the fact it's difficult but it's a dangerous tightrope to tread and I think this game (at least so far) leans on the "too difficult" side for me. An entertaining retro point 'n' click adventure with great audio in terms of voice acting and soundtrack, however the game isn't as well polished in other areas and the game is a bit on the difficult side for my tastes.